A kind of dumb, silly, and corny movie from the eighties, this one might have been popcorn fare for kids back when it came out, but it doesn’t hold up at all today. 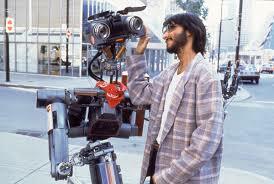 Short Circuit is a pretty amateurish movie. It was successful back in the 1980s, as a lighthearted comedy about a robot that escapes it’s makers and comes to live with a caring woman, but the plot is extremely thin and often silly. Back at the time when this movie was made, and special effects were all done by hand, cute creatures were being embraced by the public as icons. Creatures like Gizmo from Gremlins or Number Five from this film. Both movies were popular enough to spawn sequels. It took movies like Robocop and terminator to change people’s attitudes about robot creature movies. Those later two films were darker, more stories oriented, and helped people realize that plot, and tone really did matter. 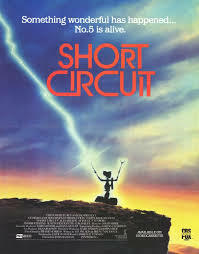 Short Circuit was the basic stepping-stone that led to bigger and greater things. It’s the kind of movie you really don’t need to think about. Not even a little bit. And that turns out to be a pretty lousy formula. The movie begins at the nova robot facility during a demonstration of these new high tech robots that shoot lasers and can be used by the military. A lot of high up government officials are there, watching the demonstration, and everything goes according to planned. The scene is a sort of introduction to the robots. After that we meet Stephanie who is living alone, dealing with her ex-boyfriend, who doesn’t get the message that they’ve broken up. He’s annoying and bothersome and won’t leave her alone. To call him one-noted would be an understatement. At that’s our intro to Stephanie. We meet the good guy scientist, Newton Crosby, because the investors are asking to meet him and the head of the robotics tries to get him to come out of hiding. Crosby is played by 80s goofball Steve Guttenberg. He was popular during that decade, but mainly because he found himself in lame, dopey movies that the audience could just vent through, like this film or three men and a baby. Now we’re done with introductions (boy does the movie waste a lot of time on those), and ready for the big problem. A robot named Number Five is traveling along with his peers, movie down a hallway, when a garbage cart comes out from another hallway and ends up knocking him through the wrong door. The garbage cart robot keeps pushing until number 5 ends up on a truck surrounded by garbage. The truck is taken away from the facility and onto the open road. That’s when Number Five drives through the side of the truck and finds himself on his own. Everyone at the facility is panicked. Especially a hard as nails general named Schroeder, played by thought guy jerk gown. Bailey, who is best known for playing the jackass police lieutenant Harris in the police academy movies. Harries, like just about every other character in this film, is an absolute cliché. He’s mean as hell and he has his mindset on finding and destroying the robot. Number 5 of course comes to Stephanie and she calls the robot facility so that they can come and pick him up. Only Stephanie is convinced that there are real feelings inside of him and that he’s “alive.” For this reason, when she hears that they plan to rewire him and reset his circuits, she throws a fit. They take him away anyway, and he escapes again. How creative. Not only does he just escape again, but also he goes right back to Stephanie. This plot is all just back and forth with no real interesting points at all. Yes, Crosby is a good guy, but it’s only because he acts like one. He doesn’t say jerky comments or talk about destroying Number Five like the other scientists do. Instead, he slowly becomes convinced that maybe Stephanie was onto something and that maybe Number Five really is alive. That idea in itself is completely idiotic. The robot copies personalities that he sees on TV and in other places. That doesn’t mean he’s alive. He’s still a machine, run on electricity. Not only is the plot of this movie dumb, but the humor is pretty lousy too. It’s not an absolutely terrible movie, simply because it’s not really painful to watch, but there is certainly nothing positive to take away from it either. I understand why this movie was popular, because audiences had never seen a movie about a pet robot before, and were ready to buy into anything that used these kinds of effects. But it is certainly not a good film.